Hillary Chybinski: family portrait. . .
. . .i have been considering a family portrait for sometime. . .but since Tara W lives on the other side of the country. . .I've been stumped for what to do. look no further. 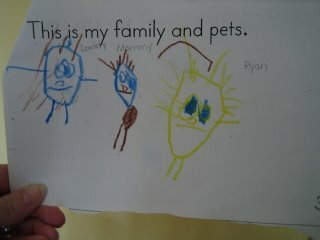 ryan took care of everything at kindergarten today. gosh we are loving kindergarten. he has had an amazing 9 days - if it can only keep up for 12 more years. . .
That is the CUTEST!!! Don't worry--very good chance that he'll keep loving school. My dd loved it from the first day of kindergarten and she's in her first year of high school--and still LOVES it! !